Explore Yard Art for Stylish Metal Planters. Durable and lightweight, steel and aluminum are the ideal materials for planters that will stand up over time. 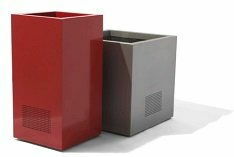 The design, the materials, and the quality of the end product, make our metal planters stand out. Metal Planter Designs can be customized to your exact specifications. This includes size, shape and anything else you would like to do. 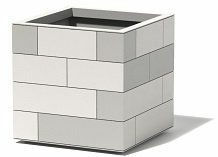 Metal planters fabricated with the best materials, carry a 5 year warranty, and are designed and made in the USA. 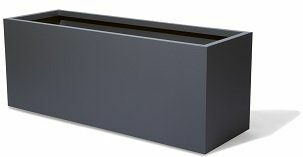 All Metal Planter Designs are available in Mild Steel, CorTen, and Powder Coated Aluminum, guaranteed to never rust. Also available in thousands of custom finishes. Looking for a High Quality Metal Planters? Yard Art has been a leader in providing ultra durable, high quality metal based garden furniture and water fountains since 2006. We provide solutions for all your indoor and outdoor requirements as well as commercial metal planter needs in the most unique and creative way. 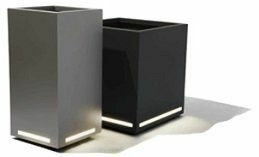 We’ve a wide range of planters that can be engineered to accommodate your project need and can be used in various locations including gardens in the backyard of your home or in commercial spaces such as offices, hotels. Showrooms, malls and conference centers. Moreover You can customize your metal containers according to your display or theme as you will find multiple shapes, colors and sizes at Yard Art. Some of our planters qualify for LEED points toward your building. Metal plant containers have become a highly visible exterior site furnishing for office buildings as they can be custom made to fit into any outdoor space in the office environment. They also come in unique shapes that could also act as an interior décor for your home or office. Our metal garden planters have an AAMA rated warranted powder coat finish. They can either have a linear, angled, or a radius edge. You can also light up an area in your garden with illuminated metal planters or LED Lighted Planters. We can guide your project from helping you brainstorm, to value engineering the design, to project completion and the logistics of the delivery. Our experience with coordinating your needs in any job site will give you confidence that your container needs are in good hands. We can also accommodate time sensitive jobs, when you need something done quickly, but it still requires the special attention to be done properly. Our experience is a value add you can take advantage of, in addition to the unique solutions at an affordable cost. Our metal planters are made using Corten Steel, Mild Steel, Marine Grade Aluminum, and Stainless Steel. If you have other metals you would like to explore, please contact us and we will likely be able to find a satisfactory solution. Our metal planters have a warranty that covers them in every weather condition. Tapered metal planters can add a dramatic effect to your environment. Metal planters were not used in many corporate locations before, but in the last couple of years, metal planters have become more popular, and are used increasingly in many business establishments, restaurants, malls to make surroundings more attractive and appealing. We can provide you with a quick turnaround on your custom metal planter project. We strive to surprise with finishing ahead of time, and surpassing expectations with service and the finished product. We cater to commercial requests, so if you are thinking of going for placing metal planters throughout your office or across all branches of your commercial places, or a municipal location, please contact us if you have questions. Our liaisons are waiting to hear about your project, big or small, and provide solutions to what you need. Looking for an enhanced design element? 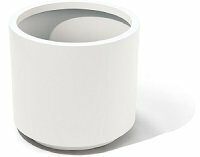 • Integrated, weather resistant speakers for either indoor or outdoor use. • Pre-assembled IPE wood Lattice. With design extras like these take any regular planter and turn it into something unique. 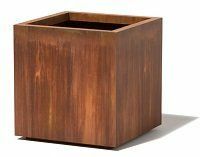 Don’t settle for just any planter, check out our selection and find something that fits you. When it comes to creating not just a functioning planter but a work of stunning art, no one does it better than Yard Art.